You know and trust SuperHeroStuff.com and we value your trust. We want you to know how we collect, use and protect information about our online guests. This policy sets out important information about how we use your personal data, so please read it carefully. We will ask you to provide certain personal data when you buy a product, sign up for a newsletter or competition, create an account, or use our website at www.superherostuff.com (the "Site"). Fulfill orders and provide service information - We gather from you information about your product selection, your name, delivery address, your payment information and any further information needed to fulfill your order (such as any special delivery instructions). We will ask you for your phone number but only to contact you about your order should there be an issue. We will never sell or share your phone number with another party other than our shipping provider. Process returns and address complaints and queries - When you return a product or make a query or complaint, we will keep the information you give us to ensure that we comply with our contractual and regulatory requirements, to ensure appropriate further communication with you, and to improve our products and services. Remember you and view activity on our Site - If you have allowed access to cookies, our Site will automatically remember you the next time you visit. Cookied allow us to pre-populate fields to make ordering easier and to improve your experience by directing you to information on our Site that we think will be of interest to you. We also gather details of your visits to our Site, including pages viewed, accessed or visited, your use of any interactive features on the Site, performance of our marketing efforts, and the delivery of relevant marketing messages to each guest. We might also contact you to remind you about items in your shopping basket which you have not checked out. Communicate product offers, events and competitions - We will use contact details you have given us, along with information about your previous orders, to send you information about our products, offers and events that we think will be of interest to you. See here for details on how to unsubscribe from marketing. Update our records - If you would like to update the personal data we hold about you, please update your account information and preferences on our Site or contact us using the details below. Legal purposes - We sometimes need to use personal data that we have gathered from you or third parties (such as law enforcement or credit reference agencies), or that you have provided to us, to comply with our legal obligations or for other legal reasons (for example, to trace fraudulent transactions). We may also use your personal data where it is reasonable for us to do so and where there is no disadvantage to you. Report browsing information - We will collect information, if available, about your IP address, operating system and browser type for system administration and to report aggregate information to our advertisers. This is statistical data about our users' browsing actions and patterns, and does not identify any individual. Directly from you (for example, when you place an order or sign up for our newsletter). By observing how you use our Site (for example, from your transactions or the products that you view). To fulfill your orders and make the Site available, we may share your personal data with our service providers where necessary to make products and services available to you and to promote our products and services to you. Access to your personal data: you may request access to a copy of your personal data. Withdraw consent: you may withdraw your consent at any time. Please contact us using the details located below if you would like to withdraw your consent and we will delete your data in line with your right to erasure below. Rectification: you may ask us to rectify inaccurate information held about you. If you would like to update the data we hold about you, please contact us on using the details below and provide the updated information, or log on to your profile at http://www.superherostuff.com and update your information. Erasure: you may ask us to delete your personal data. If you would like us to delete the personal data we hold about you, please contact us using the details below, specifying why you would like us to delete your personal data. Portability: you may ask us to provide you with the personal data that we hold about you in a structured, commonly used, machine-readable format, or ask for us to send such personal data to another data controller. We only store your personal data for as long as is necessary for the purposes listed in the ‘What Information do we collect and how do we use it?' section above. We may have to keep some of your information (such as payments information) for longer where this is reasonably necessary or required by law or regulation (for instance, to prevent fraud or resolve disputes). We may obtain information about your general internet usage by using a cookie file which is stored on the hard drive of your computer. Cookies contain information that is transferred to your computer's hard drive. They help us to improve our Site and to deliver a better and more personalized service. You can refuse to accept cookies by changing the settings on your browser. This may, however, mean you are unable to access certain parts of our Site. Superherostuff.com is committed to protecting the security of your data. We will treat all of your information in strict confidence and we will endeavor to take all reasonable steps to keep your personal data secure once it has been transferred to our systems. We adopt appropriate data collection, storage, and processing practices and security measures to protect against unauthorized access, alteration, disclosure, or destruction of your personal data and data stored on our Site and associated databases. Superherostuff.com recommends that you take measures to better protect the information you provide online. When we have given you (or where you have chosen) a password which enables you to access certain parts of our Site, you are responsible for keeping this password confidential. We ask you not to share your password with anyone. For security purposes, your password should not be written down and should be regularly reset. A strong password should not include easily obtainable personal data; it should be at least 8 characters in length; and it should be a combination of letters and numbers. All online purchases made through our Site take place safely using the latest internet security technology to protect our customers. When we transmit sensitive information such as your credit card number and address details over the Internet, we protect it through the use of 128-bit encryption certificates and the Secure Sockets Layer (SSL) protocol -- the industry-standard method for protecting web communications. Our Site may, from time to time, contain links to and from the websites of our partner networks, advertisers and affiliates. If you follow a link to any of these websites, please note that these websites have their own privacy policies, and we do not accept any responsibility or liability for these policies. Please check these policies before you submit any personal data to these websites. We want to personalize your experience with Superherostuff.com so that you get the most relevant information about our products and services at the right time. Superherostuff.com does this by creating a profile of you for marketing purposes allowing us to only recommend products we think you're going to like. We will build your profile based on information you give us and we may supplement this information with marketing insight from third party companies and information in the public domain. 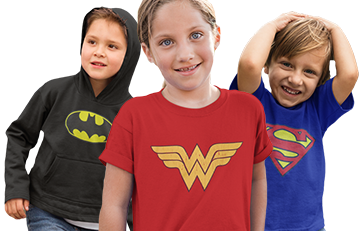 You don’t have to give Superherostuff.com any of the following information, but without it, we cannot tailor our marketing to suit you and we may not be able to fulfill your order if you buy online. When you sign up to receive our emails, Superherostuff.com will remember your email address. If you tell us exactly what you’re interested in when you sign up, Superherostuff.com can make sure we only send you information about the products we know you want to hear about. When you go on our Site, Superherostuff.com may analyze how you use our Site by recording your mouse clicks, mouse movements, page scrolling, and any text keyed into website forms (not including bank details or any sensitive personal data). Superherostuff.com uses this information to improve our Site usability and may use your activity on our Site to personalize marketing to you when you visit other websites. 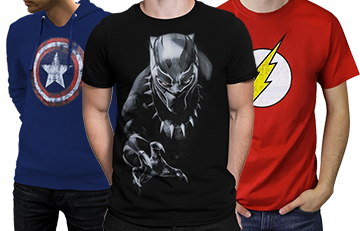 When you make a purchase from us online, Superherostuff.com will remember your name and email address along with purchase history so we can make sure you’re the first to find out about products people like you are buying, and products that will complement the ones you already bought from us. 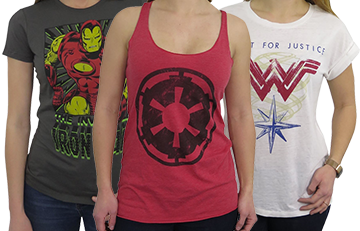 If you don’t complete your purchase, Superherostuff.com will keep track of what you put in your shopping cart for when you return to our Site, and may remind you of what is in your shopping cart via email or banners on other websites. When you link with us on social media, Superherostuff.com may use the information you have publicly shared on social media to make sure you only get product recommendations from us that are suited to you. If you give us information about your friends (which you should only do with their permission), Superherostuff.com may recommend suitable products to them. If you submit user-generated content through our social media channels, we may use your username or email address to communicate with you in addition to using your photo. We may also use your IP address and geolocation to filter content by region, country, or other local area. Such data is only used with your consent. You can unsubscribe from Superherostuff.com’s marketing communications at any time by clicking on the link found at the bottom of every marketing email. Our security measures are designed to prevent anyone from stealing and using your credit card number. In addition, consumer protection laws protect you against the unauthorized use of your credit card. Under the Fair Credit Billing Act, if your credit card is used without your authorization, your liability for those fraudulent charges cannot exceed $50. So, if someone steals your credit card or your credit card number, your liability is limited to $50 no matter how much the thief charges to your account. If your credit card provider does hold you liable for any part of this $50, we will cover the entire liability for you, up to the full $50. We will cover this liability only if the unauthorized use of your credit card resulted through no fault of your own from purchases made at our website while using the secure server. In the event of unauthorized use of your credit card, you must notify your credit card provider in accordance with its reporting rules and procedures.